Deal of the Day:	£44.99 & FREE Delivery in the UK. There’s very little effort on the part of the baker because the breadmaker is a sophisticated appliance with a computer memory that does all the work for you. It’s as simple as one-two-three 1. put in the ingredients, 2. select programme from the menus and press start 3. Wait for your bread. 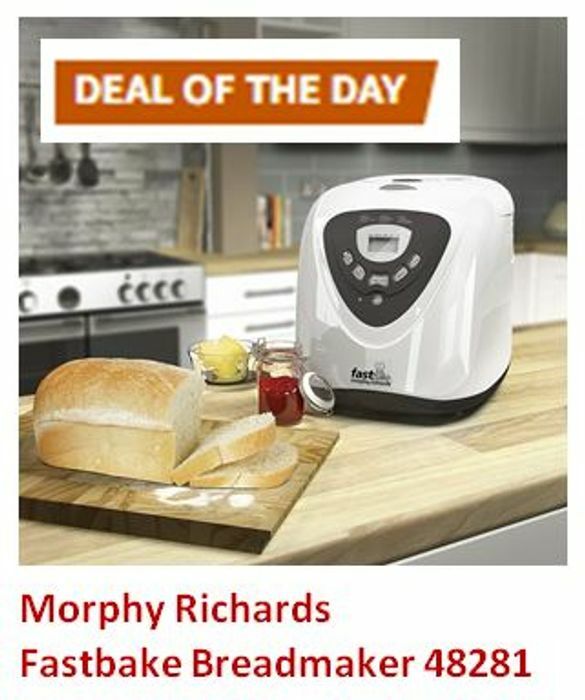 But don’t stop at baking bread in this appliance. Besides being able to do all kinds of speciality breads, including wholewheat, you can also prepare doughs for bread rolls, pizza, cake and jam. Everything is easy and tastes homemade – because it is. Choose from 12 programmes from Basic Whites to Cakes, Jam and Dough with the choice of 3 Loaf sizes (1lb, 1.5lb and 2lb loaves). The Fastbake Breadmaker also gives you the option of choosing from 3 crust settings for bread to your taste every time. The clear viewing window allows you to monitor the baking process and the 13 hour delay allows you to bake whenever is best for you. The easy to read LCD display and cool touch body means that using and handling the breadmaker is easy. 12 programmes from Basic Whites to Cakes, Jam and Dough. Fastbake programme for a freshly baked loaf in under 50 minutes. 3 Loaf sizes - Bakes 1lb, 1.5lb, 2lb loaves. 3 crust settings for bread to your taste every time. Viewing window to monitor baking process.